I know, this seems a little weird to include on a website for quantitative research services. But once you get to know me, sooner or later you’re going to hear about my homemade eggnog, and you might as well have the whole story. I come from a long line of bullheaded women. (For those of you wondering where I got that certain, irritating je ne sais quoi, this is it.) The photo on the left shows me at one year old, sitting on my mom’s lap. My dad’s mom, Evelyn, is on the right and my great-grandmother Sarah Allie Boyd is in the center. All three are gone now, but they are all in my thoughts as the holidays approach every year. 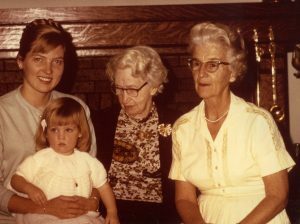 My great-grandma Allie was remarkable woman, and obviously made a hell of an impression on the family as my grandfather Boyd, my dad Boyd, my Uncle Robert Boyd, my brother Boyd, my sister Sarah, my son Andrew Boyd, my niece Sarah Allie and I (Susan Allie) all carry her name. Grandma Allie died when I was very young, but I’ve heard stories of her all my life. To my father, she was a surrogate mom, and touched him with so many small kindnesses that he still teared 70 years later thinking about her. To me, she has always represented strength, intelligence, creativity, compassion, and irreverence — a combination of qualities I hope every day to carry in myself. So now to the recipe — but first, a quick warning. 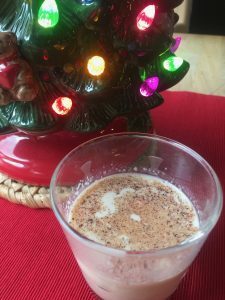 THIS EGGNOG IS IN NO WAY GOOD FOR YOU, NO MATTER HOW YOU TRY TO JUSTIFY IT. It’s full of fat, sugar, liquor and UNPASTEURIZED RAW EGGS. While no one in my family has every gotten ill despite over 90 years of drinking this stuff (maybe it’s because of all the liquor in it), you drink at your own risk. Make sure your hands and all utensils and storage jugs are nice and clean before you start. Beat the egg whites until stiff, then beat in 1/2 cup of sugar. Empty into a large pot. Beat the egg yolks, 1 cup of sugar and salt until very light in color. Combine with the egg whites and stir until blended. Add half & half (or cream), milk, and liquor. Stir well. Pour into gallon jug and quart jar (I use clean milk jugs). HERE’S THE NEXT STEP, AND IT’S IMPORTANT! Store the eggnog in a cool cellar or garage for 1 week to 10 days. DO NOT REFRIGERATE! So this is the part that freaks people out. Yes, I know — raw eggs, milk, etc., all stewing on the floor of your garage for a week without refrigeration. I’ve tried to make this and refrigerate it, and it just doesn’t turn out as well — the liquor just doesn’t blend in and become as smooth and luscious when you refrigerate it. Of course, you can try that if it makes you more comfortable, but I’ve found leaving it on the concrete floor in the garage, where it stays cool but not cold, works great. Shake it every once in a while as all the air in the eggs will condense and you can consolidate it into fewer jugs if you want. After a week or so, stick it in the fridge, and it will last for another couple of weeks just fine. Serve it with nutmeg on top and make sure you confiscate everybody’s keys before you get going — it’s deceptively potent. Oh, and my husband has a milk intolerance so he can’t handle much of it full-bore, but likes to mix it with 7-up for an eggnog spritzer (yuck). There you go. Make it, drink it and enjoy. I know Grandma Allie and my mom would want you to.